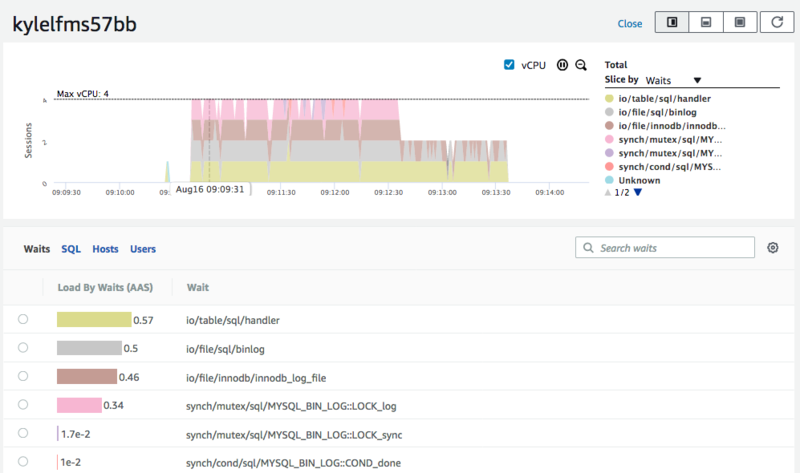 Whitelist preview of Performance Insights has just started on RDS MySQL and it gave me a chance to visually compare load profiles of MySQL 5.6 and 5.7. 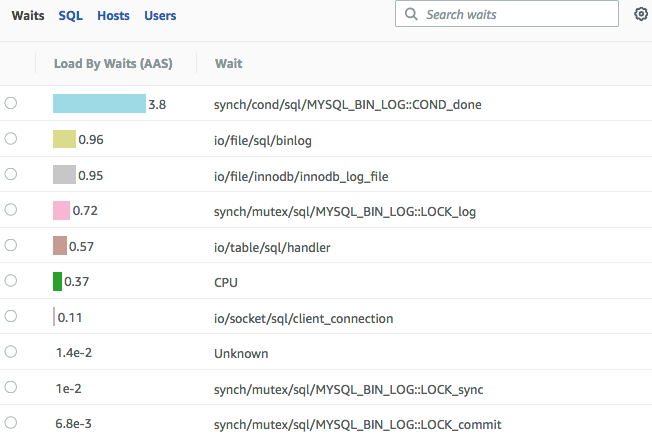 I first tried to use sysbench and ran into some curious anomolies. Which looks like a small load. The DB instance and load driving machine are both in the same AWS region (N.Virginia) i.e. not much latency. If there is a lot of latency between the machine driving load and the database then it can often be hard to drive a high load. In this case latency was low so it should be easy to drive a high load. which is radially different. Where as on 5.6 the host was mainly idle since load was well below the # of vCPUs on 5.7 the load is above the # of vCPUs indicating a bottleneck. 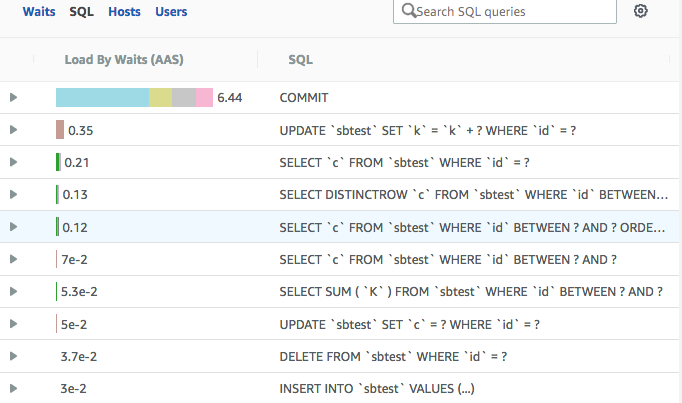 Let’s look at the SQL showing up in Performance Insights. For MySQL 5.6 the list was quite limited and there was no “commit”. Looking at the waits on 5.6 and 5.7 they are quite different as well. 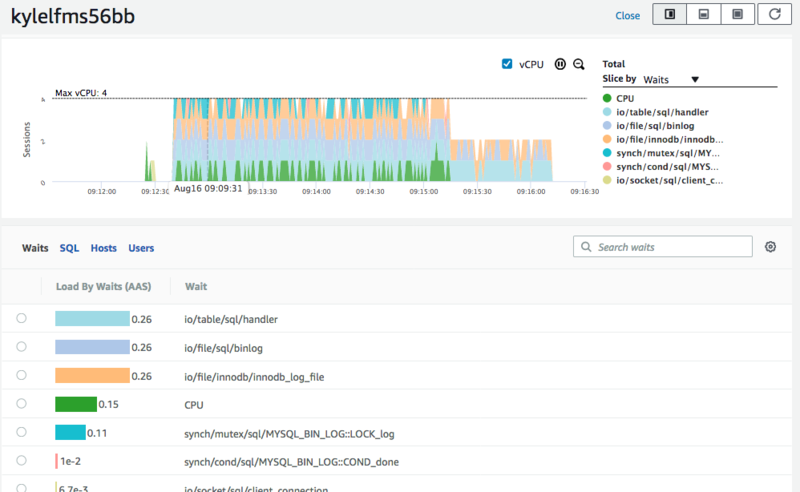 MySQL 5.6 spends most of it’s time on CPU and none on write to stable storage. At first I started to wonder if there was something fundamentally different between 5.6 and 5.7. The main difference I was seeing was on COMMIT and writes to stable storage so rather than trying to go debug sysbench , I decided to run a basic workload that should help me see if there was a basic big difference between 5.6 and 5.7. I ran a workload of 4 sessions, each updating a single row table 10,000 times. In one case autocommit was on and the other it was off. With autocommit on, I’d expect a lot of waits on writes to stable storage and with it off I’d expect much less. It turns out the load looks almost exactly the same on 5.6 as 5.7. On the left of each chart below there is a little spike a few seconds wide. That little spike is 40,000 updates by 4 users in a few seconds with hardly any wait as autocommit is off. Then the load jobs sleeps for 10 seconds, then the large load in both is the 40,000 updates with autocommit on and we wait on writes to stable storage as expected. Looks like something is seriously wrong with sysbench on MySQL 5.6. I’ll have to dig into this.